Où diable l'amour va-t-il se nicher! Joseph Pennell, Le Stryge, 1893. In 1844, Édouard de Beaumont (1821-1888) was one of several artists asked to illustrate a new edition of the novel Notre-Dame de Paris by Victor Hugo (1802-1885). First published in 1831, the book was an enormous success and the 1844 edition was to be a sumptuous new printing with two dozen new engravings. 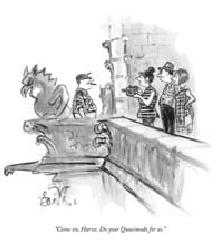 The popularity of Hugo’s book not only resulted in multiple editions in many languages but also in the restoration of the Cathedral of Notre Dame itself. 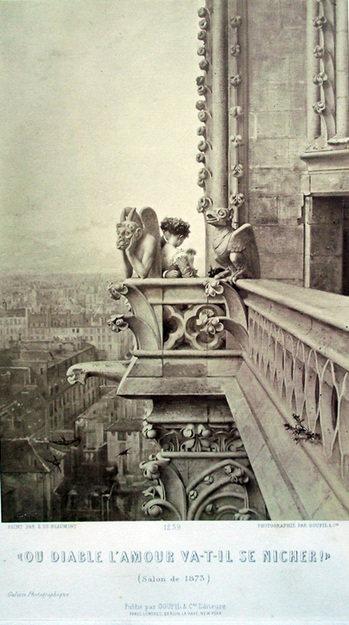 Beginning in 1845 and lasting for twenty-five years, the controversial rebuilding included the addition of the gargoyles on the Galerie des Chimères. 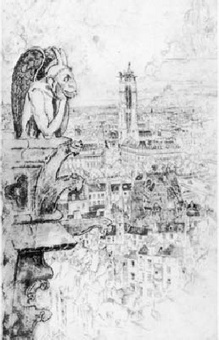 Many visual artists were inspired to create images of the structure, using in particular the gargoyles as romantic icons. 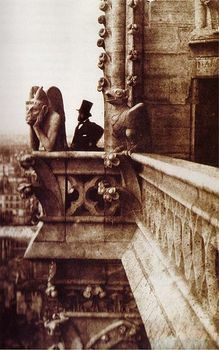 Charles Nègre (1820-1880) and Henri Le Secq (1818-1882) playfully photographed each other on the north tower in 1853 and Nègre’s image remains a favorite in museum collections around the world. 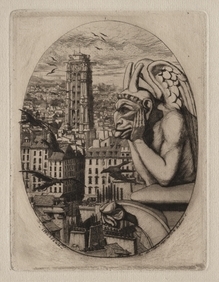 Views of “The Vampire” looking out over the city of Paris turned up everywhere, including an etching by Charles Meryon and later, a painting by Winslow Homer. Twenty years after Nègre made his photograph, Beaumont was inspired to revisit the theme in a painting he called “Où diable l’amour va-t-il se nicher!” Historians have translated this enigmatic title several ways, offering “Where the devil will love nest,” “Where will Devil Love nest,” or “Where the hell is love going to nest!” among other variations. Rather than drag his easel up all those stairs, Beaumont simply copied the major portion of the photograph exactly, substituting only the portrait Le Secq for a couple in love (the woman in a startlingly green dress). Beaumont’s painting was not only accepted into the Salon of 1873 but won second prize. An engraving of the painting was made by Léon Gaucherel and the French firm Goupil et Cie. had both an albumen photograph and a woodburytype created. They first sold them as part of their series Galerie photographique and then, published the woodburytype in their sumptuous journal Galerie contemporaine littéraire, artistique (v. 8, 1884) along with a portrait of the artist and several other paintings.